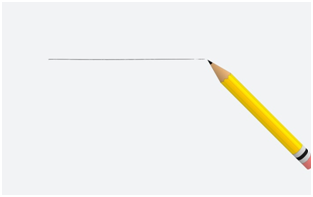 It is a flat surface in which a straight line joining any two points lies completely on that surface only. It is a curve that lies in a single plane. It may be closed or open. Any common closed curve composed of only line segments is called a polygon. The polygons can be classified into various types on the basis of their no of sides or vertices. It is a line segment which connects two non-consecutive vertices of a polygon. For the figure shown above, SQ and PR are the two diagonals for the given quadrilateral. The area which is covered inside the closed curve is called its interior. In the fig; the shaded portion reflects the interior of the given closed curve. The area which is covered outside the closed curve is called its exterior. In the fig; the shaded portion reflects the exterior of the given closed curve. It is a polygon in which no diagonals lies outside the boundary of the polygon. For the given figure, all the diagonals (AD, AC, BE, BD, CE) formed are present in the interior of the polygon. And there are no diagonals possible outside the given polygon. It is a polygon in which at least one diagonal lies outside the boundary of the polygon. For the given figure, the diagonal LN is present in the exterior of the polygon. A polygon which is both equiangular and equilateral is called a regular polygon. For example square, triangle, etc. In both square and triangle, the length of all the sides as well as the angles formed is equal. A polygon which is either not equiangular or equilateral is called an irregular polygon. 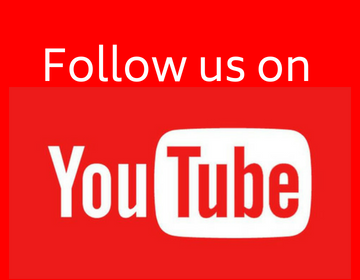 or example rectangle, kite, etc. For the given rectangle figure, all the sides are not same. For the given triangle figure, neither the sides nor the angles are same. The sum of the three angles of a triangle is 180o. The sum on the measures of the external angles of any polygon is 360o. It is a quadrilateral with a pair of parallel sides. Figure below show some trapeziums. In all these figures, there is at least one pair of parallel side. Figure below show some quadrilaterals which are not trapeziums. In all these figures, there is not even single pair of parallel side. It is another special type of quadrilateral in which there will be exactly two distinct consecutive pairs of sides of equal length. 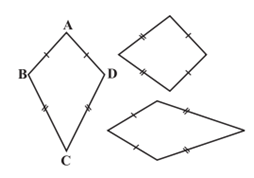 Figure below show some quadrilaterals which are kite. 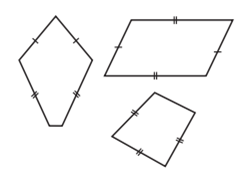 Figure below show some quadrilaterals which are not kite. A parallelogram has four sides and four angles. 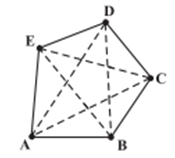 For the parallelogram ABCD, the four sides are AB, BC, CD & DA and the four angles are ∠A, ∠B, ∠C & ∠D. Here, sides AB and CD as well as sides BC and DA forms pair of opposite sides. Similarly, ∠A & ∠C and ∠B & ∠D forms pair of opposite angles. Moreover, the sides AB & BC; BC & CD; CD & DA; DA & AB all are adjacent sides. Similarly, angles ∠A & ∠B; ∠B & ∠C; ∠C & ∠D; ∠D & ∠A all forms adjacent angles. (i) The opposite sides of a parallelogram are of equal length. (ii) The opposite angles of a parallelogram are of equal measure. (iii) The adjacent angles in a parallelogram are supplementary. (iv) The diagonals of a parallelogram bisect each other. It is a quadrilateral which has all sides of equal length. A rhombus has all the properties of a parallelogram as well as that of a kite. Property: The diagonals of rhombus are perpendicular bisectors of each other. It is a parallelogram with equal angles. Property: The diagonals of a rectangle are of equal length as well as they bisect each other. It is a rectangle parallelogram with all the sides equal. Property: The diagonals of a square are perpendicular bisectors of each other. IT IS HELPFUL FOR EVERY ONE. I LIKE IT!